The GET READY! Planner Tables and Worksheets are all below. These are downloadable, fillable PDF's organized by how they appear in GET READY! 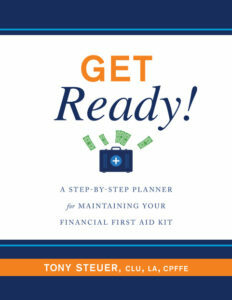 You can purchase the GET READY! Planner which includes all of the tables with detailed information on what each table is about, where to find that information along with valuable tips and resources. Click here to go to Amazon. And if you already have your copy of GET READY!, thanks! Emergency Contacts Table 1 from GET READY! Personal Papers and Legal Document Table 2 from GET READY! Critical Emergency Action List Table 3 from GET READY! Contents of Wallet Table 4 from GET READY! Storing Documents and Valuables Table 5 from GET READY! Storage Unit Table 6 from GET READY! Personal Information Table 7 from GET READY! Children Table 8 from GET READY! Grandchildren Table 9 from GET READY! Health (Medical) Information Table 10 from GET READY! Pet Information Table 11 from GET READY! Military Service Table 12 from GET READY! Memberships: Clubs and Organizations Table 13 from GET READY! Charitable Organization Table 14 from GET READY! Digital Life (Devices and Services) Table 15 from GET READY! Log-in Credentials Tracking Table 16 from GET READY! Reward and Loyalty Programs Table 17 from GET READY! Checking and Savings Accounts Table 19 from GET READY! Certificates of Deposit (CDs) Table 20 from GET READY! Stocks Table 21 from GET READY! Treasury Securities (Bills and Bonds) Table 22 from GET READY! Corporate Bonds, Government Agency Bonds and Municipal Bonds Table 23 from GET READY! Mutual Funds Table 24 from GET READY! Exchange-Traded Funds (ETFs) Table 25 from GET READY! Collectibles Table 26 from GET READY! Stock Options Table 27 from GET READY! Business Interests & Ownerships Table 28 from GET READY! Royalties (Copyrights, Trademarks, Patents and other licensed property) Table 29 from GET READY! Debts and Obligations Owed to You Table 30 from GET READY! College Savings Accounts Table 31 from GET READY! ABLE Accounts Table 32 from GET READY! Individual Retirement Accounts (IRAs) Table 33 from GET READY! Self-Employed and Small Individual Retirement Accounts Table 34 from GET READY! Employer Retirement Accounts: 401(k), 403(b) and 457 Plans Table 35 from GET READY! Pension Plans Table 36 from GET READY! Other Employer and Group Retirement Plans Table 37 from GET READY! Social Security Table_38 from GET READY! Home (Primary Residence Table_39 from GET READY! Vacation Home - Secondary Residence Table_40 from GET READY! Time Share - Vacation Club Table_41 from GET READY! Investment Property Table_42 from GET READY! Farmland Table_43 from GET READY! Undeveloped Land Table_44 from GET READY! Commercial Property Table_45 from GET READY! Cars Table_46 from GET READY! Planes, Boats and Recreational Vehicles Table_47 from GET READY! Major Property Inventory Table_48 from GET READY! Total Compensation Statement Table_49 from GET READY! Employee Cash and Employee Benefit Total Compensation Tables 50-54 from GET READY! Other Earned Income - Second Job Table_55 from GET READY! Online Income - Sales Table_56 from GET READY! Royalties Table_57 from GET READY! Investment Income Table_58 from GET READY! Retirement Income Table_59 from GET READY! Car Loans and Leases Table_60 from GET READY! Home Loans -Mortgage & HELOC Table_61 from GET READY! Private Mortgage Insurance Table_62 from GET READY! Vacation Home & Time Share Loans Table_63 from GET READY! Student Loans Table_65 from GET READY! Investment Property Loans Table_66 from GET READY! Business - Commercial Property Loans Table_67 from GET READY! Personal Debts and Loans Table_68 from GET READY! Credit Cards Table_69 from GET READY! Debt Consolidation Loans Table_70 from GET READY! Renting and Leasing a Residence Table_71 from GET READY! Utility and Household Bills Table_72 from GET READY! Education Care and Support Expenses Table_73 from GET READY! Subcriptions and Services Table_74 from GET READY! Memberships, Season Tickets, Clubs and Organizations Table_75 from GET READY! Taxes Table_76 from GET READY! Tax Documents Table_77 from GET READY! Property Taxes Table_78 from GET READY! Auto Insurance Table_79 from GET READY! Disability Insurance Table_80 from GET READY! Health Insurance and Health Care Costs Table_81 from GET READY! Homeowners and Renters Insurance Table_82 from GET READY! Life Insurance Table_83 from GET READY! Long Term Care Insurance Table_84 from GET READY! Annuities Table_85 from GET READY! Insurance Miscellaneous Policies Table_86 from GET READY! Power of Attorney Table_87 from GET READY! Health Care and Advanced Directives Table_88 from GET READY! Organs and Body Donation Table_89 from GET READY! Burial and Cremation Table_90 from GET READY! Viewings, Visiitations and Wakes Table_91 from GET READY! Funeral and Memorial Services Table_92 from GET READY! Celebration of Life Ceremony and Reception Table_93 from GET READY! Obituary Table_94 from GET READY! Ethical Will Table_95 from GET READY! Wills Table_96 from GET READY! Trusts Table_97 from GET READY! Digital Estate Planning Table_98 from GET READY! Pet Estate Planning Table_99 from GET READY! Cash Flow Analysis and Budget from GET READY! Net Worth Statement from GET READY! Retirement Savings Tracker from GET READY! Financial Calendar from GET READY! Credit Report Monitoring from GET READY! Stepping In - Steps to take from GET READY!